The plots, which have not still created a track, can be displayed for selected radar. Once the track is created, the plot symbol is not longer displayed. The track label is a set of essential information related to the track. This information is organized in lines and fields. The contents for track label can be configured offline, and for each track type, three configurations are currently available, one for each role (approach, enroute and tower). The current role is displayed in the Main Menu area and can be modified by DATABLK window. For tracks whose Ground speed is greater than 999 knots, this speed is indicated in track label by the previous “^” symbol in YELLOW colour. Ex. Ground speed of 200 knots is indicated in track label by the value “200”, but 1200 knots is indicated as ^200. Here is a brief squema about label fields for each track type in each role, for first given configuration. Flight Data Processing (FDP). It is based on RISC redundant computers. It manages the flight plans generated within the System or coming from external sources, including the Repetitive Flight Plans (RPLs). It confirms all flight data inputs, calculates the flights‟ progression and keeps all controllers inform by means of screen displays and flight plan strips printing. Redundant configuration designs the System, having an FDP as operative and another one as reserve, with the possibility to switch them. Surveillance Data Processor (SDP). It is based on RISC redundant computers. It receives and processes data (primary, secondary and meteorological) coming from the radar sites. Next, it performs the merge all the received information to create a coherent airspace picture for controllers‟ (SDD) presentation. It also performs surveillance tasks (STCA, MTCD) between aircraft and integrates the radar information and the flight plan information in order to get a precise tracking. The System is duplicated (operative/reserve) being possible to switch them. Radar Communications Processor (RDCU). It centralizes the System radar communications to interpret and convert the received radar formats to join them. The System is composed of two RDCU units working parallel. It is possible to carry out the received radar data reproduction during an established period. Situation Data Display (SDD). 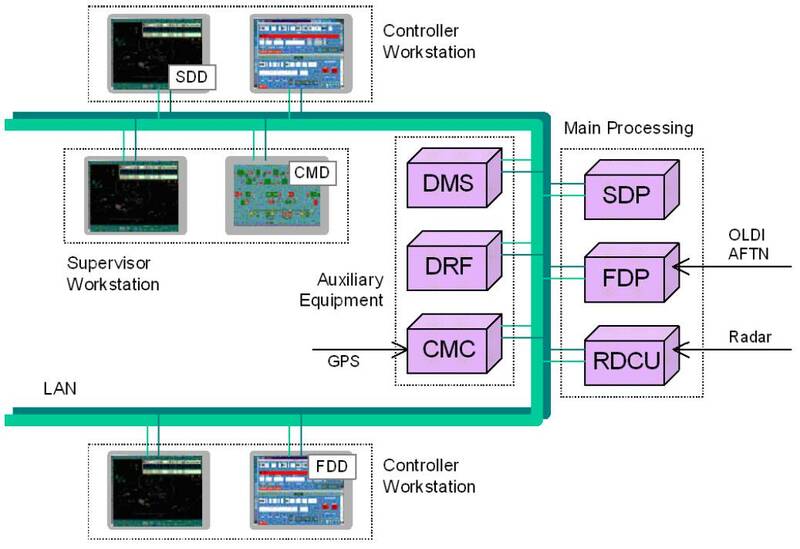 It is based on powerful workstations that receive data processed by both the SDP and the FDP. Later on, it manages all these information for a coherent displaying at the controllers screens (SDD). At the same time, it displays additional relevant information such as geographic maps, meteorological data, etc. Flight Data Display (FDD). It displays information concerning flight plans not supplying data display of data on air situation. It allows controllers to perform adjustments on flight plans and other significant data. Control and Monitoring Display (CMD). It performs a continuous real time supervision of the System. It also allows monitoring and System elements‟ status change, sectorization modification, management of certain configurable parameters, etc. Commom Timing Facility (CTF). It receives the GPS time, spread to all the subsystem (via LAN) and all clocks (via Terminals) with NTP protocol. Data Recording Facilities (DRF). It performs the continuous recording of tracks, flight plans data and controller actions to allow a later reproduction and analysis. Adjust Correction. Correction (azimuth and range) applied to all plots received from the radar when the System detects an adjustment error. The adjustment error is calculated by subtracting the range and azimuth of the fixed transponder (received from the radar) from the nominal values, which are within the adaptation data for the fixed transponder. Collimation Error. It is composed of a range error and an azimuth error. The collimation error is calculated when the primary plot reinforces a secondary plot by calculating the primary plot differences in range and azimuth from the secondary plot. Lost FP. A track (aircraft) is lost when a radar return has not been received for a particular target. When this happens, the target tracker projects a target position based on the target‟s previous positions and generates a new track position update for the display. A lost track is dropped from both the display and the target tracker‟s database if its lost time exceeds a Variable System Parameter limit. Mono-radar Track. Information set, evolving in time, related to an aircraft, based upon radar information received from a unique radar site and used by the computer for tracking purposes. Multi-radar Track. Information set, evolving in time, related to an aircraft and obtained from the synthesis of all mono-radar tracks that represent the above referenced aircraft. Plot. Set of information, with relation to an aircraft, received from the radar set. Primary Surveillance Radar (PSR). Radar sensor used to determine the position of an aircraft. Radar. A device which, by measuring the time interval between transmission and reception of radio pulses and correlating the angular orientation of the radiated antenna beam or beams in azimuth and/or elevation, provides information on range, azimuth, and/or elevation of objects in the path of the transmitted pulses. Secondary Surveillance Radar (SSR). Radar sensor used to interrogate aircraft transponder equipment to receive SSR Codes, barometric pressure information, and/or the SPI. The Mode 3/A SSR Codes are used to identify individual flights in ATS. When the SSR detects a flight, its SSR Code is used to correlate the flight with the corresponding Flight Plan. SSR Codes assignment and management is a fundamental part of the civil ATS systems. As SSR Codes are based on 4 octal-digits, there are only 4096 available codes to use around the world. Track. It is the projection on the earth surface of the aircraft route. The route direction at any point is expressed in degrees (magnetic North). Track Label. Collection of tabular data displayed on one to four lines. The data label is linked to its corresponding track by a leader line. Transponder. L-band radar receiver/transmitter carried aboard certain aircraft. It transmits a beacon code and Mode C altitude (if so equipped), in response to an interrogation from Secondary Surveillance Radar. The data provided by a transponder can be in any of the following forms: Mode 3/A, Mode 2, or Mode C.
Фактура поста закончилась, далее - свободные рассуждения. Радары УВД, АПОИ и ИНДРА заточены под стандартные условия сопровождения целей, то есть, не на случай отвала копита и падения. Одна РП дает исчерпывающий объем информации по целям для ИНДРА, чтобы решать эти задачи. Переключение между данными разные позиций каждые 5 секунд бессмысленно и даже вредно с точки зрения надежного сопровождения целей - повышает нагрузку на систему в целом. Тем более, что разные РП не могут физически облучать одну и туже цель ровно со сдвигом 5 секунд. В случае 10-секундного цикла данных с РП при 5-секундном цикле вывода отметок на дисплей проще построить экстраполированную промежуточную точку, зная направление и скорость цели, и это делает (! )АПОИ РП. Можно с этой позиции посмотреть на пары отметок от 13:20:47/13:20:52 и далее, где, ВОЗМОЖНО, каждая первая - измеренная, вторая - экстраполированная. Ответ, почему на 117 градусах ИНДРА брала за основу данные с РП "Батуринская", ВОЗМОЖНО, кроется в разрешении радаров по углу и дальности. Вероятно, позиция цели более точно определяется той РП, которая находится на перпендикуляре к трассе цели, а не на одной линии с ней. Ответ, почему после 13:20:17 РП "Батуринская" потеряла центроплан, ВОЗМОЖНО, кроется также в расстоянии 260 км, в снижении центроплана, что вместе с радиотенью создало условия для существеннного уменьшения отраженного сигнала. В результате можно предположить, что дело так, или так, или близко к этому. - траекторией ветоши, на видео очевидца у шахты Прогресс. При недостатке информации предположений может быть много. Как вариант: Индра перешла на экстраполяцию отметок по прямой до Глуховского леса в связи с уходом боинга в пике. Если это было крутое пике, как у TWA841, то во время пикирования боинг находился на одном расстоянии от радаров, потому отраженные сигналы накладывались друг на друга. С точки зрения Индры боинг остановился. А поскольку это нелогично, то она перешла на визуальную экстраполяцию, а в мозгах пыталась строить треки из имеющихся от радаров отметок. После выхода боинга из крутого пике где-то перед 13:20:47 отраженные сигналы от него растянулись по карте, и Индра "увидела" трек и начала выводить его с 13:20:47. Даже если это были отметки не от центроплана, а от его баражировавшей части. Приблизительно так. смотри - там два радара смотрят под разными углами - Батуринская и Усть Донецкая. т.е. на трассе они его видят под одним углами ,а вот когда он падает в грабово под другими. Условия видимости на трассе точнее у одного радара ,а при падении у второго.Также мы знаем время обзора антенны - 10 сек. Если мы предположим ,что они идут на экране диспетчера чередуясь 10+10+10 и 10+10+10 ,но выводятся по 5+5+5+5 ,т.е. ИНДРА их просто мешает через один ,то зная это их можно разделить. Кемет, спасибо за ссылки, пополняю знания. Первое, что бросается в глаза (возможно, ошибаюсь) описывается система УВД первого поколения, где АПОИ могли обрабатывать данные только одного радилокатора. Уже давно эпоха второго поколения, когда АПОИ одновременно обрабатывает данные PSR и SSR, и выдает в центр УВД результирующую информацию, а не данные каждого радара в отдельности. Задача обобщения данных нескольких источников рассмотрена в следующей главе с позиций комплексного гипотезного сопровождения. В большинстве известных систем этот подход не приобрел доминирующей роли. Считается, что в вычислительном отношении предпочтительно сначала прокладывать траектории объектов независимо по данным каждого источника, а на следующем этапе – этапе третичной обработки – использовать их для повышения качества отображаемой диспетчеру информации. Траектории каждого ВС, наблюдаемого с разных ракурсов несколькими радиолокаторами, при обобщении позволяют не только точнее определять и предсказывать местоположение объекта, но и оперативно отслеживать текущие значения погрешности каждого источника измерений. В ГА обычно эксплуатируются двухкоординатные источники ПРЛ, позволяющие измерить лишь наклонную дальность и азимут объекта. В отсутствии ВРЛ значение высоты искусственно присваивается наблюдаемой цели и уточняется в процессе сопровождения алгоритмически либо по диспетчерскому вводу. Не случайно при наличии только данных ПРЛ половину рабочего времени диспетчера занимают переговоры с пилотами, причем половину переговоров составляют справки о высоте полета. 2. Символ потери сопровождения ВС, который появляется в формуляре, если в течение двух и более обзоров по ВС отсутствует РЛИ. 3. Значение текущей высоты в десятках метров (4 цифры) относительно стандартного давления 760 мм ртутного столба. В плановом формуляре сопровождения отображается высота, указанная в плане полета. 4. Символ тенденции изменения высоты полета – Δ соответствует движению в фазе набора высоты,  - фазе снижения, горизонтальный полет идентифицируется незаполненным (пустым) полем. 5. Заданный эшелон полета, отображаемый в сотнях метров (3 цифры), заносится в формуляр сопровождения вручную. 6. Путевая скорость полета (в плановом ФС индицируется скорость полета, указанная в плане). Путевая скорость определяется по радиолокационным измерениям и отображается в км/час (4 цифры). Имеется возможность вызывать на отображение в этом поле остаток топлива в процентах по данным ВРЛ (лидирующий символ Т и три цифры). - запрошенный эшелон полета из плана (буква 'С' и три цифры). Векторы экстраполяции отображаются на экране в виде прямых линий по ходу движения, начало которых находится в центре символа ВС. Конец вектора указывает упрежденное положение ВС. Расстояние от трека до конца вектора рассчитывается на основании путевой скорости полета ВС и указанного диспетчером времени экстраполяции (от двух до пяти минут). Вектор корректируется по курсу и скорости полета ВС на каждый момент обновления информации на экране. вот пример - в одном посту борту присвоен индекс, во втором нет. Дело дошло до фальсификаций? А ничего, что дальше все отметки идут только 3416? Борт вышел из Ростовской зоны и ростовский диспетчер снял собственную метку. Приблизительно так. И вопрос не в деталях, как работали АПОИ и Индра. Возможно не совсем так, как описаны в талмудах деда Л.Е.Рудельсона, время идет вперед. Вы пользуетесь данными Российских РЛС.А украинские невозможно достать? 1. Кабина не оторвалась сразу. После взрыва и улёта мелких фрагментов обшивки первым был отделён участок обшивки, который испытывал максимальные отжимающие нагрузки по набегающему потоку воздуха - скальп. 2. Через 15 сек после того как оторвало скальп не выдерживают крепления участков, примыкающих к дыре оставленной скальпом - крыша и левый борт бизнес-салона. Их тоже срывает. 3. В таком виде самолёт держится ещё секунд 25 после чего происходит срыв обшивки справа и слева по борту. Кабина ещё на месте, т.к. ещё имеются сохранившиеся шпангоуты. 4. Позиция 6 в таблице выпадает из картины разрушения . нужно смотреть тщательнее этот багажник. 5. Сорванная обшивка повреждает кожух правого двигателя и отсекает часть левого крыла и повреждает левый двигатель. С этого момента тяга производится только правым. Происходит заваливание самолёта на левую сторону. Начинается разворот влево . 6. Целую минуту самолёт движется в таком виде, медленно разворачивась влево. Отрывается кабина, отрывая с собой (по идеи) и фрагмент 6.
происходит резкая децентровка планёра, самолёт разворачивает по вертикали, это усиливает нагрузку на конструкции в средней и задней частях самолёта. 7. Но ещё 4 минуты он продолжает лететь, хоть и с потерей скорости и высоты. Правый мотор работает. При спуске за эти 4 минуты до высоты 500 м нагрузки на конструкии становсятся слишком большими и начинат разрушение средней и задней частей самолёта. Этот момент уже наблюдают с земли. 8. Через 36 сек после начала полного разрушения обломки самолёта падают на землю возле Грабово. Это мы не знали свидетелей Сепаратиста ещё. Время оборота антенны каждого радара - от 4 до 10 секунд. За 10 сек Боинг пролетает 2500. С одной стороны. Первичный радар фиксирует скорость ВС , дальность до ВС и азимут. Вторичный радар ПРИНИМАЕТ от ВС его высоту и скорость. Но для Боинга за один оборот антенны радара погрешность по дальности превращается из 50м в 3км (250м/с*10с+50м)! А эшелон за 10 сек может изменится с 10000м до 7500м. С другой стороны. Устройство сбора полетных данных (DFDAU) собирает и одновременно передает скорость, высоту и курс ВС на FDR (параметрический самописец) и транспондер (ответчик для вторичного радара). ЗЫ. Если перестал принимать и записывать параметры полета FDR, то это не значит, что транспондер ТОЖЕ перестал их передавать. Но, в это верится с трудом. Первичный радар фиксирует скорость ВС , дальность до ВС и азимут. Эти первичные радары скорость не вычисляют. В принципе, радары могут измерять радиальную скорость цели, а по ней вычислять путевую по двум отраженным сигналам. Но для этого, помимо радиальной дальности, они должны знать изменение высоты цели между этими отраженными сигналами. А эти радары не умеют определять высоту цели высоты. Так (если ничего не напутал). Если перестал принимать и записывать параметры полета FDR, то это не значит, что транспондер ТОЖЕ перестал их передавать. У нас есть данные, что ADS-B транспондер перестал передавать инфу после 13:20:03. На этом основании можно предположить, что аналогичная судьба постигла и УВД-ответчик - он падал в Рассыпное. - Паралелльно Индра получает инфу о центроплане от Усть-Донецкой АПОИ, но просто держит ее в памяти, не переключается на нее, так как по заложенному в нее алгоритму логичнее на высоте 10 км выводить отметки по прямой, пусть и экстраполированные, чем ребусы с резким поворотом и резким снижением скорости. Следовательно, резкий переход 893>593 только на экране благодрая описанному выше ребусу. а что передает в 13,20,35 скорость и эшелон и летит по прямой на скорости 906 км/ч ,если у него оторван кокпит ? и без кокпита может быть такая скорость ? без кокпита - без датчиков скорости и комнаты управления может транспондер передавать ? Так Вы сами старину Рудельсона не читали, а мне подсунули?! Нехорошо! 6. Путевая скорость полета (в плановом ФС индицируется скорость полета, указанная в плане). Путевая скорость определяется по радиолокационным измерениям и отображается в км/час (4 цифры). У нас есть данные, что ADS-B транспондер перестал передавать инфу после 13:20:03. У вас есть данные о том, что в боинге был установлен ADS-B? Если выкинуть данные с ФлайтРадара24 ? Странно полностью применять информацию из учебника, тем более, выпущенного в 2006 году (сколько он писался?) к работе конкретного ПО УВД, тем более, иностранного. А Индра будет заменена на КСА УВД Синтез-Р3. Давно пора, слишком много нелестных отзывов об Индре, да и валюта за рубеж ушла. Да и системы двойного назначения должны быть отечественными. А то АНБ выдало какую-нибудь фигню в Индру перед 13:20:03, вот мы и наплодили тем. PS стер выше, раз не надо. Почему не надо?! Извлек кое-что общее и полезное для нашей ситуации. А есть трасса на карте согласно описанной схемы падения? Непонятно долго летел на малое расстояние до Грабово. Если медленно, то откуда рев пикирующего центроплана? Кто знает, на какой высоте человек (точнее, падающий труп) с земли выглядит как точка. В среднем, исключив особую остроту зрения. А есть трасса на карте согласно описанной схемы падения? Непонятно долго летел на малое расстояние до Грабово. Так это мы сделали ДО опубликования Отчёта, ДО исследования меток радаров, ДО анализа видеозаписей, ДО свидетелей Сепаратиста. Только по голланской картине нахождения обломков. Конечно, сейчас нужно вводить корректуры. Но время до разворота - 40 сек, пока никто не опроверг. То есть по отметкам вплоть до Глуховского леса? На какой скорости и до какой высоты? И как затем такая махина развернулась больше, чем на 90 градусов? Где участок с ревом? Тело падает 3(?) минуты, допустим увидел за 1(или раньше?) минуту до падения, то есть в 13:22. Если в это время был конец рева, то центроплан упал в 13:21:30, если начало - то позже. Возможно, "я оглядываюсь" могло быть реакцией на начало рева. Есть что посчитать и подумать. Ну, где-то от 10" до 1'. Если 1' - то для среднего роста - это 6,5 км. не только. еще и mode-s был. Вы какую-то очень знакомую высоту предложили!!! Итак, 6,5 км - это возможности зрения. Если в чистом небе, то свидетель увидел бы "две точки" в 13:21:23. Но до этого он должен услышать рев пикирования, чтобы поднять голову (то есть, рев зародился не позднее 13:20:40). Рановато, наверное. Вот только не надо так сразу наезжать! Это были самые первые потуги. Были такие и меня в начале августа. Саму таблицу приводить не буду, Ваша намного точнее, а описание того что видел на экране, выложу, если не против. Точка 5 соответствует времени 13.20.27 в Вашей таблице. Эти гребаный дисплей и Индра. Если верить расшифровке его отметок, то центроплан чуть ли не до последнего летел с работающим ответчиком. The plot symbol is a shape associated to a unique plot, which location in the SIT Area is automatically moved by the system in order to present the actual position of the flight. Какая РЛС на это способна, где должна стоять и сколько их было? Просто спрашиваю тебя как специалиста разобравшегося в этой тематике. И надеюсь получить ответ. Чисто геометрические возможности РП "Усть-Донецк" - не ниже 1400 м над поверхностью Земли у Грабово. Реально высота должна быть больше. дополнение: скорее всего картинку "теневого" сектора надо пересчитать, так как для расчета кривизны поверхности взято расстояние до оси Земли на 48 широте (4282 км), а надо радиус (6400 км приплюснуть до 48 широты). Кто подскажет радиус Земли на 48-й ? В результате граница обнаружения опуститься. Основная проблема в том, что мы не можем определенно сказать, какой тип отметок видим на дисплее. Определившись, можно рассуждать далее. Почему ВНИИРА за это время внедрил СИНТЕЗ в Белоруссии и в Алма-Ата - систему, превосходящую Индру по всем параметрам, в том числе и ИКАОвским, а на северном Кавказе теперь всё разнотипное, нестыкующееся друг с другом? Трасса центроплана в 3D в общем, детали надо прорабатывать. Наглядно видны соотношения, в том числе высот боинга и разброса обломков.